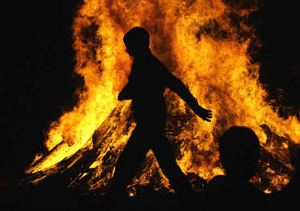 Every year, coinciding with the bonfire night celebration, a very traditional celebration is held on the coastal towns of Andalusia, when people gather together on the beaches around huge bonfires and barbecues. The 21st of June and the 21st of December are, respectively, the summer and winter solstices. In the northern hemisphere, the 21st of June is celebrated for being the longest day of the year, whilst in the southern hemisphere, the dates are the other way round. The celebrations on this day are as ancient as mankind itself. It was originally believed that after this day the sun would not return to its total splendour, a belief that came from seeing that from this moment, the days became shorter. That’s why bonfires and all types of fire rituals came about to symbolise the power of the sun and to help renew its energy. As well as these affirmations, the bonfire night is a night full of fantastic legends. Many of these declare it a time for opening the doors to a multitude of fantasies, where poisonous plants lose their power to harm and health-giving plants have their benefits multiplied. All of these fantastic beliefs mean its normal to see objects being thrown onto the fires, such as little spells, wishes or even school work, in the hope of making evil sprits disappear!. In spite all of this mysticism, the bonfire night of is primarily, for the people of Andalusia, a night of fiesta to be spent with friends, enjoying the marvellous beaches. This is one fiesta not to be missed.